Naito, S., Kondo, N., Akino, S., Ogoshi, A. and Tanaka, F. (eds) (2004). Novel approaches to control of potato scab. In Proceedings of the International Potato Scab Symposium (IPSS 2004). Sapporo: Hokkaido University. Mulder A & Turkensteen LG (2005). 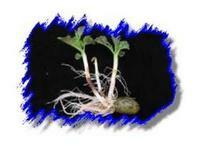 Potato Diseases: Diseases, Pests and Defects. NIVAP-Holland.